As expected the teaser trailer for Star Wars: The Last Jedi dropped at the official mega Star Wars fan convention Star Wars Celebration in Orlando this morning. We’ve watched it a few times and think we have a pretty good idea of what’s going on. So here’s our breakdown of the trailer. Let us know what you think we’re missing or don’t have quite right. Update: we done a re-write of the entire piece below with new information learned from more research online. Luke and Rey are still on planet Ahch-To one the island where The Force Awakens ended. Rey’s clearly working on her Force abilities as Luke encourages her to breath. 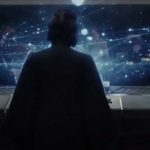 Then we cut to a battle console with the back of General Leia looking at a star chart as resistance fighters run around. Leia is on bridge of ship (we know from director Rian Johnson’s set photos that Finn and Poe are around somewhere). Most likely a Mon Calamari cruiser. 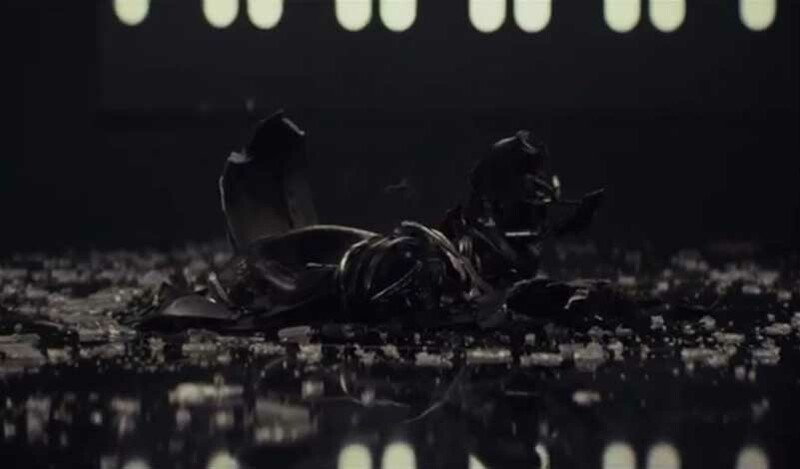 Cut to Kylo Ren’s mask shattered on the ground with Darth Vader like breath in the background and I think Obi-wan Kenobi’s voice. A shelf of books is spotted inside what is most likely a Force Tree (yes that’s a thing). 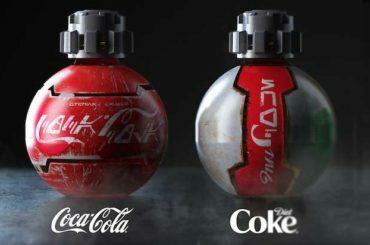 These look like some relics from the early days of the Jedi. Possibly recovered by Luke. Rey’s hand gently caressing a page that has a symbol that looks a lot like the Jedi Order symbol. This book is most likely the “Journal of the Whills” (which was name dropped in Rogue One). Then in the distance we see Rey training with her light saber as Luke watches from a distance. Looks like she gets to keep the blue light saber that was once Anakin Skywalker’s. Does that mean anything? Maybe. We see a new form of fighters that create red dust as they skimm across a flat desert. On the other side of the battle a fleet of AT-ATs (the new improved First Order kind). This salt plain is on a planet called Crait (and out of the way planet that used to house a Rebel base and is now a mining planet for The Resistance – according to Lucasfilm). Ships are called Skimmers and they’re dealing with a “very pressing and immediate” situation. We finally see Finn, however he appears to be in a medical transport of some kind. Still comatose. We know from his reports and on-set photos that he doesn’t spend the whole move getting medical treatment. Then we cut to BB-8 (Yeah!) and Poe Dameron, in flight suit, running through a station that’s under attack. 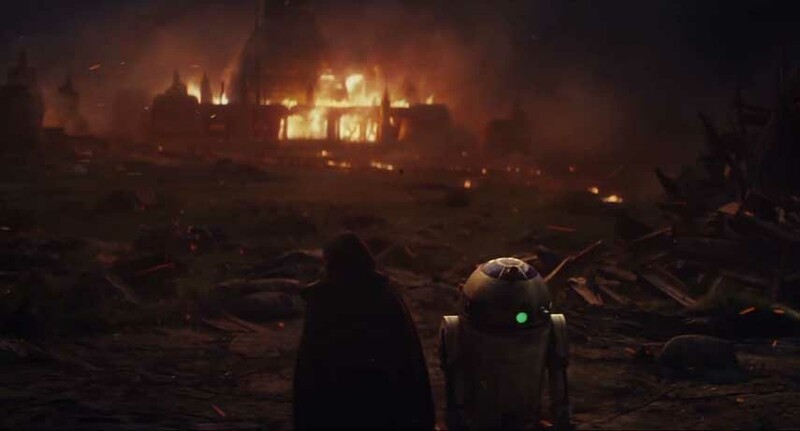 In the hanger a ship goes up in flames as Poe and BB-8 recoil from the explosion. This is a new base, meaning The First Order probably pursued the Resistance to D’Qar. Then we’re in another atmosphere battle with the Millennium Falcon taking out a few tie-fighters. Why is the Falcon fighting tie-fighters? Either the First Order found Ahch-To and they’re forced to fight their way off planet, or Chewie returned to the Resistance with the Falcon… or maybe Rey pulled a Luke and left her training early. A few quick cuts of Rey running with her lightsaber and Kylo Ren, now with a scarred face, still pointing his red lightsaber. Cut to Captain Phasma marching through fire with her troops. Looks like this is the resistance hanger we saw blown up earlier in trailer. It’s not Star Wars with out a space battle, and we get a brief glimpse of a huge one with new resistance ships and x-wings taking on tie-fighters over a green planet. I have a few thoughts about what that means. Luke was the one who would restore balance in the force. That doesn’t mean balance the light and the dark, it means refute the whole concept of light and dark sides of the force. The Force is ‘so much bigger’ than just the light and the dark, as Luke seems to be saying in the trailer. Cut to Logo and the December release. 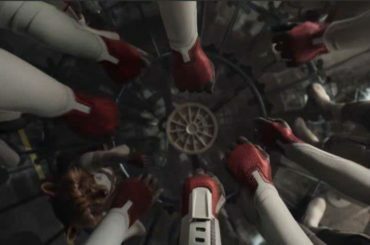 What I like best about the trailer is that I get the feeling I’ve only seen a small sliver of what’s going on in the movie. There’s still so much I need to know. Only 245 days to go!